100 Joker Staxx is a new online slot game from the developer Playson that features 100 paylines. There are five reels and four columns on the reel grid. 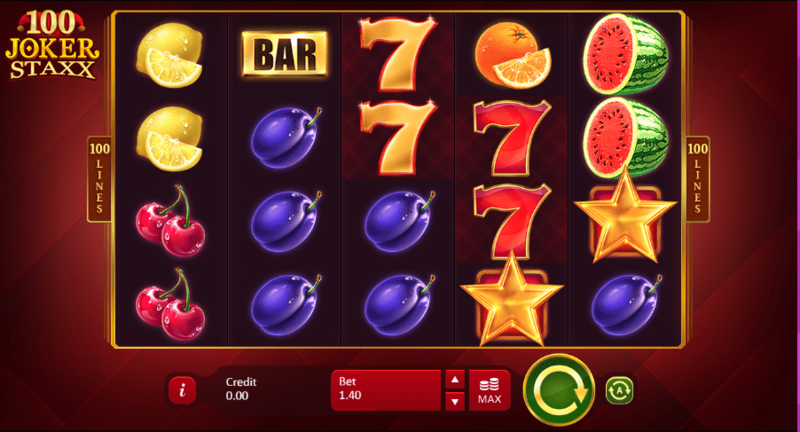 The graphics feature many of the symbols that have become an iconic part of gaming on fruit machines over the years, including cherries, watermelons and other fruit, as well as sevens and bars. The game is part of Playson’s Timeless Fruit Slots campaign, with other related titles including 40 Joker Staxx and Fruits and Jokers. As stated above, 100 Joke Staxx is a five reel game that has 100 paylines. The Wild symbol is the Joker, which can substitute for any other symbol, with the exception of the Scatters. The Scatter symbol is a gold star. If you land three or more of these stars anywhere on the reels on a single spin, then you will receive a payout regardless of paylines. 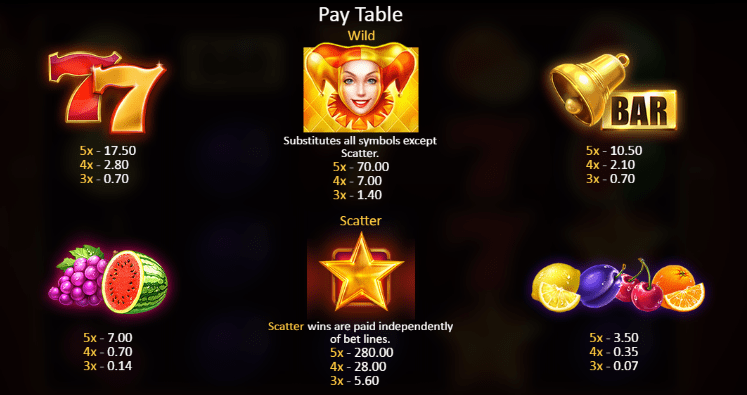 The Gold Star is also the game’s most valuable symbol, multiplying your winnings when it appears on the paylines. Spin in three stars, and your winnings will be multiplied by four. If you get four stars, you get a 20x multiplier, and five stars gets you an incredible 200x multiplier. This is not a game that makes use of any kind of exotic setting or mysterious cast of characters. The only real feature that makes it stand out from the crowd is the 100 paylines that it deploys. It’s a feature that offers the chance to make plenty of profit, but it does leave a little bit lacking in the fun department. The graphics are slick enough, and the game functions sharply and quickly. Claim your own slots promotions here today! Playson is a leading developer of slots online games, and you will probably have played one of their games if you are a regular in an online casino. Employing over 250 staff worldwide, the company now has its head offices in Malta. As well as their range of slots games, Playson also produce many versions of casino table games like roulette and blackjack, and you will probably find one of their games in your favourite online UK casino. Many of their games make use of innovative Omni-Channel HTML5 technology, which keeps game functionality crisp across a range of devices. Quality, high definition graphics are a defining feature of Playson games. This game is essentially just yet another repackaging of a traditional fruit machine. There is very little in the way of innovative storytelling or mysterious characters to frame the action. This game is all about you just getting on and playing, without the distraction of any storyline. It offers plenty of potential for both fun and profit, though, and its scatter symbols are particularly good. If you like traditional game fruit machines, this is the slot game for you. Or play other real hot games today!